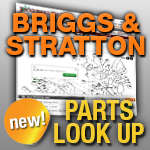 Information for installing and ordering Briggs and Stratton Electric starters on engines not equipped originally with one. The information below is everything available for ordering the correct electric starter kit. These kits do not have magnets in the flywheel to charge a battery (most engines do not have alternators if they didn't come with a electric starter). * Kits cannot be used on Vertical Shaft Models with 2 quart fuel tank welded to blower housing. For use on engines with and ALUMINUM ring gear already mounted on flywheel.